Malverne/East Rockaway girls soccer star has scored more than 100 goals but still works hard to stay on top of her game. Soccer was dubbed ‘The Beautiful Game” in the era of Pele. To see Kailey Hyland play it is an excellent reminder. 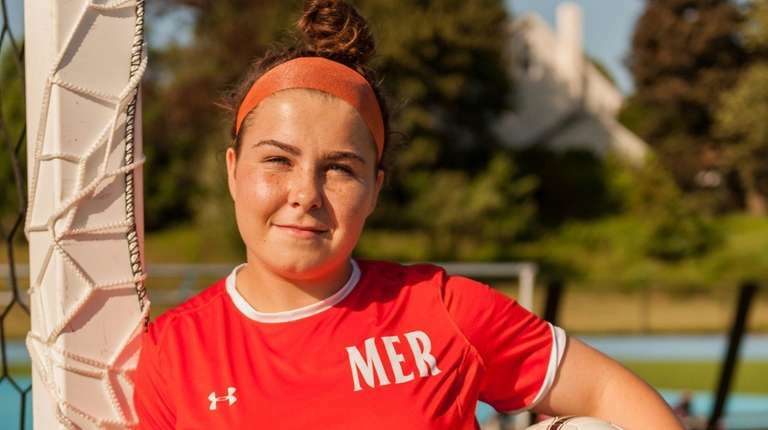 The senior center-midfielder for Malverne/East Rockaway is in her fifth year of tormenting conference foes in Nassau AB6 and other programs in the county. She isn’t beating them with size or speed — how intimidating is a girl who stands just a shade over 5-feet tall? — but rather with her skills and her mind. Hyland last month netted the astounding 100th goal of her high school career as she played in her 66th varsity game. She has piled up these goals by relying on superior footwork with the ball and a brilliance for the game that reveals how fervently she studies it. She seems to always be in the optimal position because of her field vision. And nearly every ball off her foot — shot or pass — is where a tactician would put it. That was the case in the 2017 postseason. Malverne/East Rockaway went to overtime against Mineola. There was a corner kick late in the second overtime period and Hyland — all “five feet and one-quarter inch” she said — headed the ball into the net for the team's first-ever playoff win. Hyland’s gifts for the game were apparent at a relatively early age. Lores runs a summer sports program and his son Mickey Lores, now a Suffolk County police officer, was working on soccer with a group that included Hyland. It wasn’t long before the son was telling the father “you have to see this girl — she’s ridiculous,” Lores recounted. Hyland might have been 7 at the time. Her passion has not abated. Hyland has become a true student of the game, playing it in some form every day. When she’s not on a field, she likes watching the pros and top college players. “I like to study how players position themselves on the field because I want to understand the [nuances] of the game,” she said. Gail Hyland thought her daughter might be this kind of player when the varsity wanted her in eighth grade and she finished with 18 goals and eight assists. Today she has 102 goals and 41 assists in 73 games. The equivalence is a tough one, but imagine a career 30-point scorer in basketball or a baseball player who averages more than a home run per game for his high school career. This is exceptional. There are several colleges recruiting Hyland, including a handful in Division I. Someone with skills like her's — and the leadership qualities the three-year captain regularly shows with the Rockin’ Mules — commands that. She could go for one of those offers and is giving them serious consideration. Bill Hyland, however, says it will be important for her to play as a freshman and doesn’t rule out Division II options. “A lot of times in Division I, the freshman end up sitting until there’s an opening. All of us would like her playing instead of sitting,” he said. "The right place." It makes perfect sense that Hyland would be looking for that. She’s found it enough to be a 100-goal scorer. There’s no reason she wouldn’t when it comes to taking the next step in a brilliant soccer career.